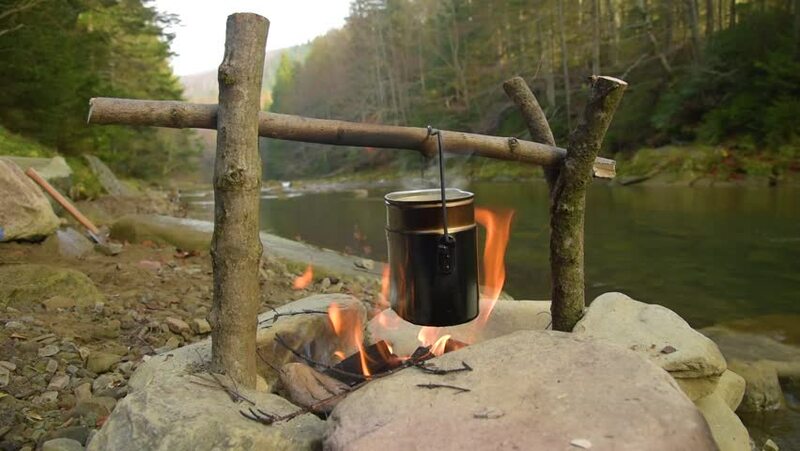 Idyllic camping scene with an axe and tea in pot boiling over open fire medium shot. Cooking on bonfire. Campfire near mountain river. hd00:23The pot on the fire. 4k00:16Cooking outdoors in cast-iron cauldron. Cooking meat on a fire. Food in a cauldron on a fire. Cooking food in nature on the cauldron. 4k00:11Bowler at the stake. Pot stands on fire, cooking food in the camp.